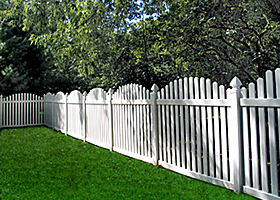 Our commitment to quality vinyl fencing is what sets us apart from our competition. We do not use fancy sales pitches to sell our vinyl fence and vinyl deck products. 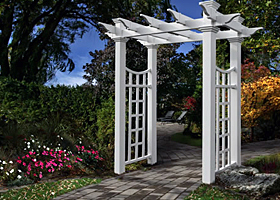 Our product sells itself based on quality, guaranteed low price, and our commitment to impeccable customer service. We have noticed a growing trend online for our competitors to boast a thicker product as a superior product. We are going to dispel that myth. The thickest vinyl/PVC you will find on the market is typically found in PVC pipe. PVC pipe can be in excess of 1/4 inch thick. If you have ever looked at a PVC pipe that has been left outside for a year, you will notice that it has yellowed or turned brittle. That is due to the lack of impact modifiers and TI02/Titanium Dioxide. Just because a vinyl fence profile is thick, does not mean that it will hold up to the elements. A high quality vinyl fence can withstand the elements because it possesses the proper amount of ultraviolet inhibitors and TI02/Titanium Dioxide which acts as a sunblock, plus impact modifiers which provide superior strength, impact resistance and flexibility. 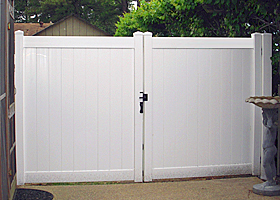 Our heavy duty vinyl fencing is the leader in combining the highest percentage of impact modifiers with the highest amount of ultraviolet inhibitors, TIO2 12 parts per 100. This creates a superior product which will withstand the test of time. Even if a product equals ours in impact modifiers and ultraviolet inhibitors, the extrusion process is another pivotal difference in separating a quality product from a lesser grade vinyl.